I love the smell of cinnamon. It relaxes me and brings back to my childhood when my mum used to prepare so many different apple cakes and pies. I can picture me and my mum in the kitchen and it always makes me smile. 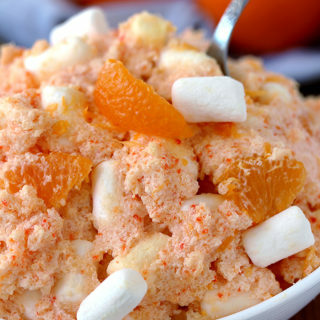 This combination also reminds of fall, so I often prepare this kind of desserts all year long. 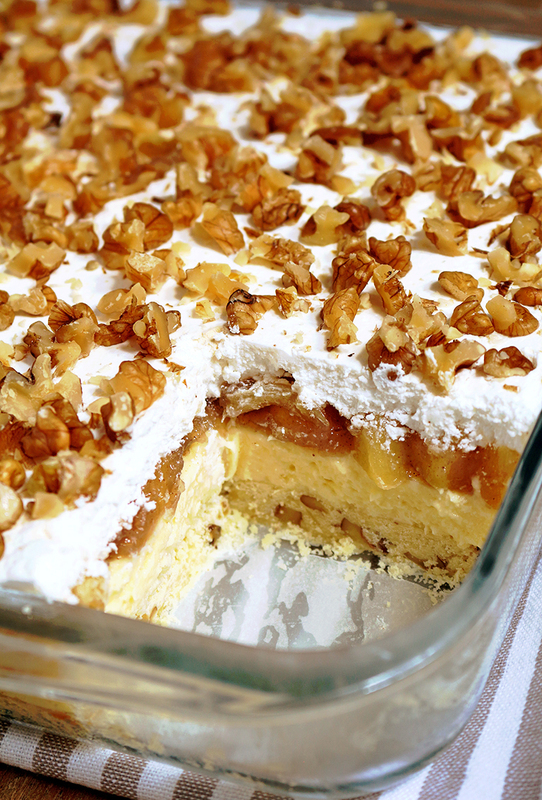 It’s delicious, with its crunchy layer made of flour, butter, vanilla and walnuts, then the creamy layer of vanilla pudding, cream cheese and whipping cream comes , and apple pie filling, over it. 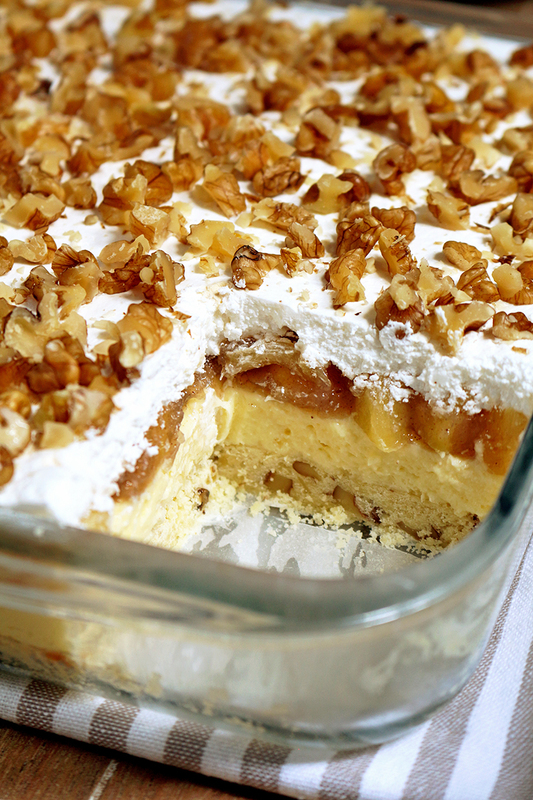 Whipping cream goes on the top with loooots of chopped walnuts. 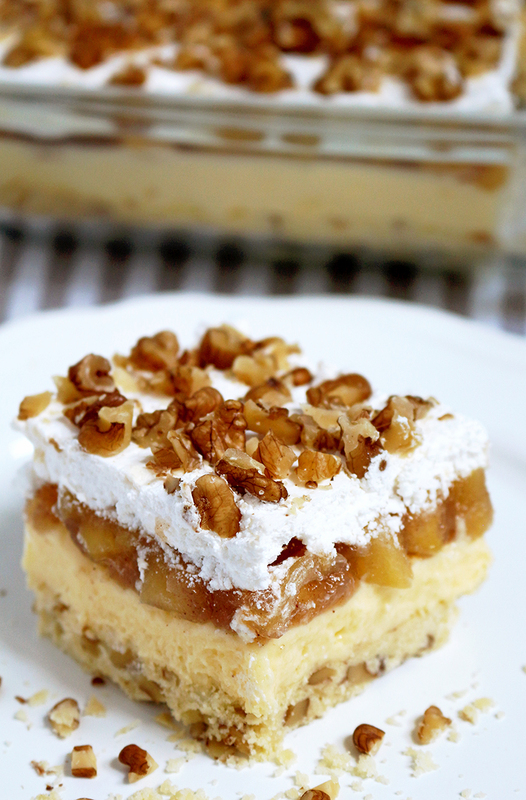 The combination of crunchy layer and walnuts with creamy layers is what I love about this dessert. This is a very light cake, just like all the other desserts I prepare. I like apple pie filling and I use it a lot, especially homemade with its incredible taste and the smell I was telling you about. If you don‘t have time, you can use already prepared apple pie filling. 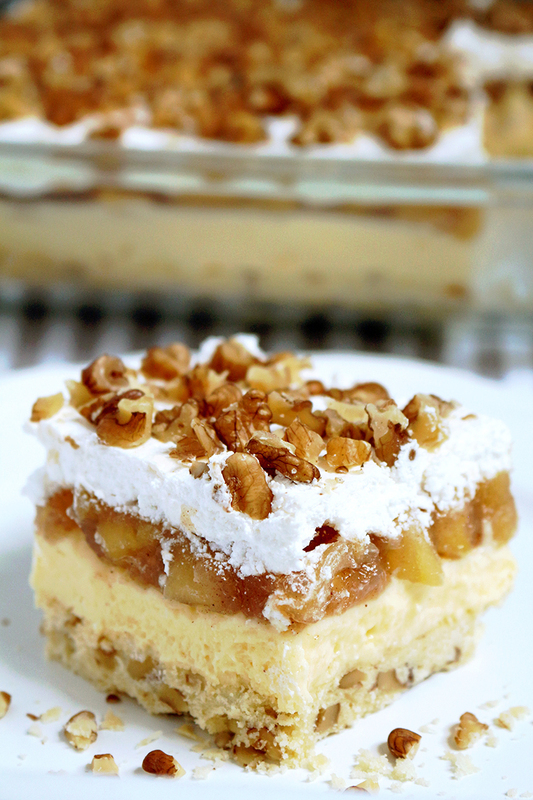 My love for apple pie filling started when I was a kid, because my mum often used to make it and continued with Caramel Apple Chimichnagas and now with Layered Apple Lasagna Dessert. If you like apples please check Caramel Apple Crisp. Since the apple season is coming, there are many more recipes to come. 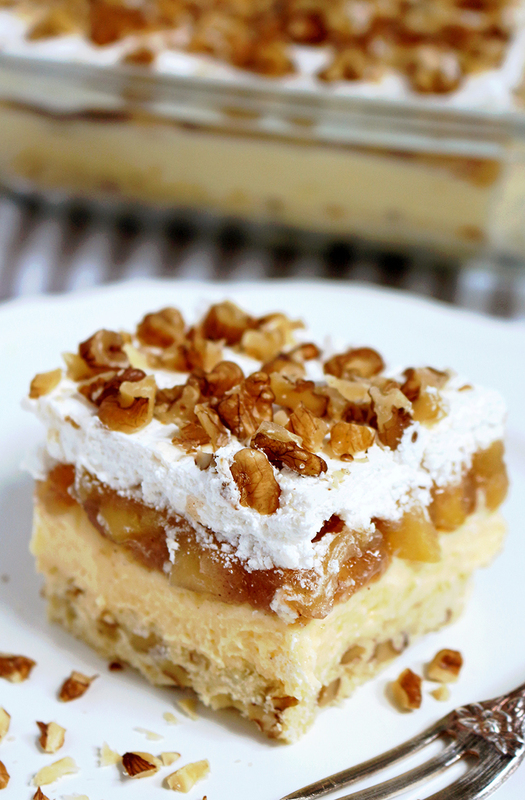 Until then, enjoy Layered Apple Lasagna Dessert! Crust – Preheat the oven to 350 F. Spray the 9x9 inch baking pan or line with parchment paper. Put softened butter in a medium dish and mix at medium speed for about a minute, then add vanilla, a pinch of salt and flour and mix until well combined. Finally add walnuts or pecans and stir. Spread evenly in a prepared dish and press lightly using your hands or some firm object. Bake for 15 minutes. Leave to cool completely. 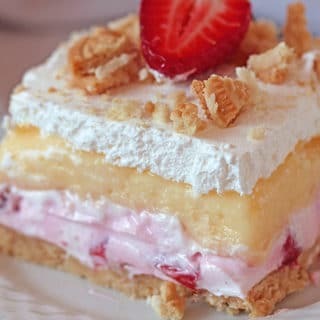 Cheesecake Pudding Layer – In a large dish put instant vanilla pudding powder, cream cheese, sugar, milk and mix with an electric mixer, medium speed until you get fine and smooth mixture. Add whipping cream and mix until well combined. 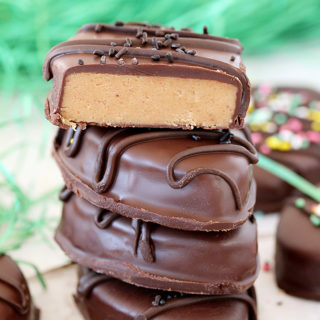 Spread it over the layer. Apple Pie Filling - In a medium dish put water, sugar, cornstarch, cinnamon, nutmeg, vanilla and stir. Cook it on medium heat for about 1-2 minutes, until it begins to thicken. Add apples and cook for about 20 minutes, stirring occasionally, until the apples soften. Cool completely. Spread over the Cheesecake Vanilla layer. Whipped Topping Layer – mix whipping cream and sugar and spread over the Apple Pie Filling and sprinkle with chopped walnuts or pecans. Leave it in the fridge for at least 4h, possibly overnight. Prepare crust first. Leave apple pie filling to cool completely, then prepare the other layers and finish the dessert. Love Apple Recipes and this like it will be a Winner ! !